DeWalt Safety Glasses, provides an ergonomically positioned for secure grip. The DEWALT DPG103 ROTEX™ Safety Glass is designed with an ultra, lightweight frame. The flexible temples feature soft, rubber grips for a comfortable, secure fit. •The Protector¹s streamlined design is perfect protective wear for both men and women. •Rubber tipped temples. Secure, comfortable fit. Distortion free lens. Provides fatigue free use. •Sleek design. Allows for a perfect fit for both men and women, ensuring worker compliance. •Weighs less than 1 ounce. Provides all day comfort. •Tough, polycarbonate lens. Impact resistant and 99.9% UV protection. •The DeWALT Contractor Pro safety glass is a more economical version of the DeWALT safety glasses. They have a rubber temple for added comfort, and a distortion free lens. •The Reinforcer provides an ergonomically-position handgrip pattern on the temple for a secure grip. •Handgrip pattern on temple. Ergonomically positioned for secure grip. •Soft, rubber nosepiece. Non-slip nosepiece provides maximum all day comfort. •Rubber tipped temples with belt ribs. Keeps glass securely in place. The Farmer is designed for the contours of the face which provides maximum peripheral protection. • Ratcheting temples. Adjusts for a perfect fit. • Rubber tipped temples. Provides snug fit for all-day comfort. • Wraparound lens. Fits the contours of the face and provides maximum distortion free peripheral protection. • Extended brow guard. Molded into the top of the lens for added protection against debris. • Tough, polycarbonate lens. Impact resistant and 99.9% UV protection. •The Ventilator offers toughness and a comfortable fit with a wraparound frame. • Full wraparound, rugged frame design. Fits securely to provide excellent protection. • Soft, rubber nosepiece. Non-slip nosepiece provides maximum all day comfort. 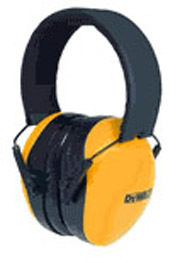 •The Interceptor is a lightweight earmuff with unmatched performance providing maximum protection. •High performance earmuff. Offers excellent noise reduction rating of 29 with maximum comfort.